Barbara “Bobbie” Jean Titus, 92, left her earthly body peacefully and went home to be with her Lord, and her husband, she loved dearly, on October 25, 2018. She was born on November 16, 1925 in Terre Haute to Oliver Taber and Hazel (Sivey) Taber, being the middle daughter of three. She married Hugh Emmett Titus on March 19, 1947. He preceded her in death after almost 54 years of marriage, passing away January 29, 2001. She worked at the Glass Factory during World War II, until she married and retired from Columbia Records in May 1971. She and her husband loved camping with friends and family at Shakamak State Park and she enjoyed out fishing her husband. She loved music and had a beautiful voice and sang every chance she could. Then danced the night away. She danced with her younger sister in Terre Haute in her early years. She spent several hours playing cards with friends and family. She loved her family and grandchildren most of all and always enjoyed babysitting with each of them. 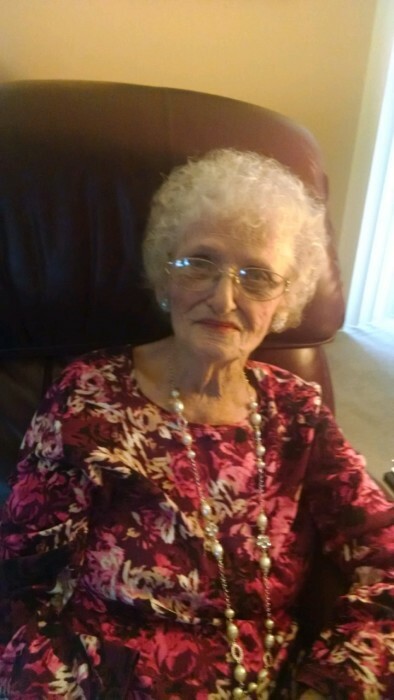 She was a loving daughter, sister, wife, mother, grandma, and great grandma to her five grandchildren, 15 great grandchildren, and two great great grandchildren. She was an avid reader and a wonderful cook. She was a member of Trinity United Methodist Church where she married her husband and raised her daughters. Recently she attended Shakamak Community Church with her daughter. She was a member of the VFW 972, where she and her husband spent Friday nights listening to music and dancing. She was one of the sweetest ladies you could ever meet and was beloved by all. She was everyone’s grandma. Survivors include her daughters Jeanne Long of Sullivan, Indiana and Nancy (BJ)Martin of Terre Haute, Indiana; sister –in-laws Dorothy Eccles of Jasonville and Patricia Titus of Winston Salam, North Carolina; 5 grandchildren Mike Burt (Christi), Rob Burt (Marianne), Michelle Criss, Shayna Neese(Jason), and Brandon King (Lindsey); 15 great grandchildren Justin Burt, Skylar Long (Torie), Cody Burt, Kaylee Criss, Adam Neese, Alyssa Criss, Kendall Burt, Grace Burt, Madison Burt, Max Burt, Allyson Neese, Sophia Burt, Aiden Neese, Sydney King, Chase King; and two great great grandchildren Alaina Liberty and Dax Spencer; and many beloved nieces and nephews. She was preceded in death by her parents; husband; and two sisters Dorothy Allen and Evelyn Wallace. Funeral services are scheduled for Saturday, October 27, 2018 at 1:00p.m. in Greiner Funeral Home, 2005 North 13th Street, Terre Haute, Indiana, 47804. Pastor Ron Riggs will officiate. Burial will be in Roselawn Memorial Park. Visitation will be at the funeral home on Saturday, from 11:00a.m. until service time. Online condolences may be made at www.greinerfuneralhome.com .